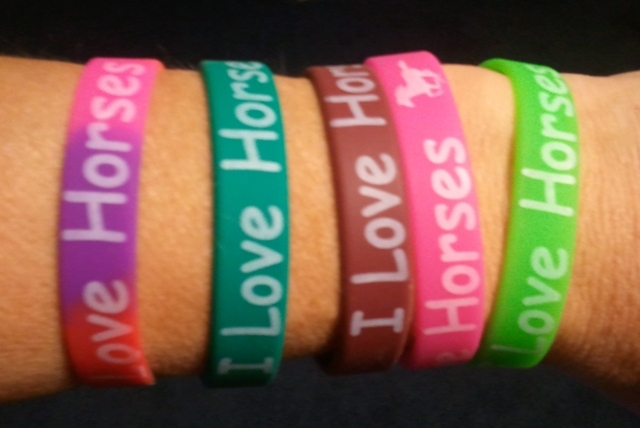 These cool and colorful stretchy rubber bracelets will show off your love of horses and support our mission at the same time! They come in hot pink, teal, lime green, burgundy and rainbow. They make TERRIFIC stocking stuffers for the holidays. Each bracelet is just $2.00 each, plus .50 for stamp and envelope. Three bracelets will fit in the same envelope without charging extra. If additional quantities are wanted, please email me for shipping costs.